Pianist Heidi Breyer’s husband, Alexander Volkov, is a wonderful painter of exquisite beauty in a style that blends intense neo-realism with a palpable sense of nostalgia. She is immersed in the artistic setting, i.e. surrounded by beautiful paintings from conception to conclusion, so that this environment has not just seeped into her musical persona, but one might say, symbiotically joined with it. It's easy to see why this relationship between his art and her music has evolved since she is in his studio and helps run the business on a daily basis. In Heidi's own words, while watching him paint…" I see what evolves and if it speaks to me, I'll know it by the middle stages of the painting process. I don't necessarily write something there and then, but when I get a window, if the painting is still haunting me, I will go to my studio and be gone for an intense amount of time and will write the piece until I'm satisfied with the concept.” Heidi has been composing music inspired by Alexander’s paintings for ten years now. Finally, the time has come for her to share this special relationship she has with her husband's artwork on Moonlight In Empty Rooms, an amazing achievement in music reflecting images and the emotional impact of both. Breyer singled out twelve compositions and the paintings associated with them, each song titled after that piece of art. Packaging of the album is fantastic, presented as a gorgeous digipack with extremely voluminous and insightful liner notes (including Volkov’s artwork) about each painting’s and each song’s origin and interpretation, as well as an overview of the why and wherefore of the project itself (including a little snippet from Volkov about his artwork). Besides the CD, the digipack features a DVD which directly marries Breyer's music to Volkov's artwork (created with Adobe Premier software). So, you get the added emotional impact of listening to these exquisite neo-classical duets while watching the artwork to which it is linked unfold – a truly immersive experience. Joining Breyer on each of the twelve selections is session violinist extraordinaire, Charlie Bisharat. However, if all you have heard from him is his great work in support of the many Imaginary Road Studio recordings produced by Will Ackerman and Tom Eaton, prepare to hear a whole other side of his violin artistry. Bisharat displays true classical chops and a playing style that will be a revelation to many of his fans, I’d wager. While there is unmistakable classical crossover theme present on the album, I was also (more than once) reminded of classic pop music of the ‘40s, perhaps of the jazz/torch song era. The melodies seemed to evoke that sensation for me. More than once I envisioned a chanteuse singing in an after-hours club, the kind of tragic romantic music that typified that style of music. On the other hand, perhaps that is just my personal evocation. Regardless, even if one does slot the album into the neo-classical genre, it is most certainly romantic music at its core, with only a few moments that elevate into power and drama. Breyer’s control of nuance and shading is a marvel throughout the disc, no matter what tempo, volume, or mood she is playing. Yet, what is just as striking is the sense of intimacy, the immediateness of her performance, especially on the more reflective, pensive tunes. This is when it becomes obvious how deeply felt these compositions are to her and how intermeshed they are in her appreciation and affinity for her husband’s artistic talents. In an email exchange with her, I compared her piano music with Alex’s paintings as two strands of DNA, intertwined to yield a single trait. Singling out specific tracks is akin to singling out one of Volkov’s paintings, i.e. it would be more a matter of how one song struck you and less of an evaluative process. Yes, some tracks here touch me more deeply, such as pensive and gently melancholic “Autumn Snowfall,” but I believe Moonlight In Empty Rooms plays best as a whole, not as the sum of its admittedly beautiful parts. The opening playfulness on “Autumn in Bruges” leads way to a more wistful and even sad main melody, albeit one with energy and a fast tempo at times. The title track is ushered in by Bisharat’s initial violin solo which gives way to a reflective piano tone poem by Breyer, and soon the two artists pirouette together, dancers in a song that combines a forceful sense of passion with a tangible but subtle feeling of loneliness. As one might expect, “The Sound And The Fury” brims with power and drama, interspersed with brief moments of respite. “Faith” (which unless I am deaf or clueless, features Bisharat multi-tracked) carries distinct hymn-like qualities during his opening solo segment, segueing to Breyer incorporating what sounds like elements of “Praise God of Whom All Blessing Flow;” not really riffing on it or extrapolating from it, but more using the opening note progression as a jumping off point. It is the longest track on the album and both Breyer and Bisharat play it out as an ode to the power of the titular word. The album closes with the sublime “End Of Summer,” and again, I hear echoes of classic torch songs, but here meshed with a tone poem aesthetic. There is sadness and remembrance at work here, but also fondness of memory. 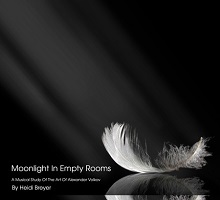 Easily the best work Heidi Breyer has yet recorded, Moonlight In Empty Rooms is as deeply felt and masterfully recorded (piano recorded at Imaginary Road Studios and mixing and mastering by Tom Eaton) an album as I’ve heard this past year. Special seems wholly inadequate in describing this work from a truly gifted artist.